Muffins are one of the easiest things to bake. In fact, whenever I am teaching someone how to bake, I start with muffins. The technique is the same regrdless of the recipe. First, in a large bowl, whisk together the wet ingredients - eggs, milk, honey, molasses, applesauce, etc. Second, in a smaller bowl, mix together the dry ingredients - flour, baking powder/soda, salt, dried fruits, etc. Third, gently fold the dry into the wet mixture (always add dry to wet so you are not stuck with unmixed flour at the bottom of your mixing bowl) until everything is barely combined. Finally, fill your tins (lined with baking cups, of course) 2/3 full and bake. Here's a recipe for Lemon Zucchini Muffins to get you started. Gently fold the dry ingredients into the wet ingredients. Scoop into lined muffin tin until the cups are 2/3 full. Bake in a preheated 400°F oven for 22 minutes. Cool slightly on a cooling rack before serving. These are good plain, but even better with a little lemon curd spread on top. This recipe makes a dozen muffins. Muffins provide a great lesson in leavening, especially this recipe because there are two different leavening agents used. Ok, but what is leavening? It is what causes your baked goods to rise by added gas bubbles into the muffins (or cake or bread, etc.). There are 4 basic leaveners used in baking: air, steam, biological, and chemical agents. Air is incorporated whenever you mix your ingredients; more air is added intentionally when you cream butter and sugar together or whip egg whites to a foam. Steam is produced whenever you bake something with water - the high temperature of the oven causes the liquid to turn into steam, which makes the dough or batter rise. Yeast is a living organism (ask any biologist) and produces carbon dioxide as it reproduces. Chemical leavening agents also produce carbon dioxide, but through chemical reactions, not breathing! Baking soda and baking powder are both chemical leavening agents. Baking soda is a base (its pH is 8.2), therefore, it reacts with acids (anything with a pH less than 7, such as lemon juice, molasses, orange juice, or buttermilk) to form carbon dioxide. Baking powder adds an acid (in powdered form) to baking soda and requires the addition of liquid for the reaction to take place. There are two kinds of baking powders, single-acting (the chemical reaction takes place as soon as the liquid is added) and double-acting (the chemical reaction takes place with the addition of liquid and then a second time when the batter is heated). 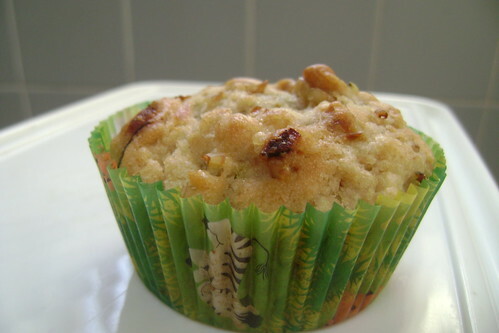 The primary leavener used in muffins is baking powder. This recipe, as in many others, baking soda is added to neutralize the acid, in our case, lemon juice. This will add additional gas bubbles to the muffins, making them less dense. Gluten - eeek! I know for many of you it's verboten. However, if you want to know the science behind baking, gluten is important. Gluten is the protein component of wheat flour. Actually, it formed from two other proteins, glutenin and gliadin. Both of these proteins have a sulfur-hydrogen group on them than can be linked to make sulfur-sulfur groups. When the sulfurs combine, gluten is formed. Gluten is stretchy and is necessary for a nice chewy bread or bagel, but completely unwanted in a tender muffin. To prevent too much gluten formation (you need a little to provide a framework for the starch to build around), you do NOT overmix the batter. That's why in the basic muffin-making technique, you gently fold the dry ingredients into the wet until they are just mixed. Muffins are best when they are tender, not chewy. So, add some tenderizing agents to the batter. Tenderizing agents do just what they sound like they do - they make your baked goods more tender. Two of the most common tenderizers are sugar and fat, very common ingredients in muffin recipes. Sugar, in any form whether it be table sugar or honey or maple syrup, loves water; it is hydrophillic. This property gives allows sugar to prevent too much gluten formation (it requires water) and to interfere with protein coagulation, both of which make your muffins chewier. Fats, like sugar, are not just a flavor enhancer, they help you have a tender baked good. They coat the proteins in flour, thereby reducing contact with liquid and (you knew it was coming, didn't you?) too much gluten formation. This fat coating also makes gluten and starch strands slippery, so gas bubbles can move around more easily. Whatever their source (butter, coconut oil, egg yolks), fats make muffins "moist", not by adding actual liquid, but by lubricating your mouth when you're eating your muffin. There you have it - the food science behind muffins. Why not bake a batch today to test out your new found knowledge? I am gluten free, but still found this article extremely helpful. Most of my efforts so far have been trial-and-error because I've had no clue about the Science behind gluten-free baking. Thanks so much for this. Glad to help, LavenderRose. Let me know if you need more info on baking with or without gluten.